We’ve worked closely with this customer for some time and his skills and ideas have become ever more adventurous. 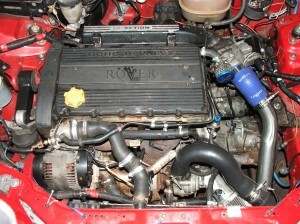 When faced with the usual K series headgasket failure he was easily talked into a T16 engine conversion. He has tackled a lot of the work himself including wiring and hydraulic installations but the mechanical engineering side has been left to us. The process is fairly simple- line up the driveshafts, get the engine as low as possible and make some mounts. Then all you have to worry about is the fact that none of the driveshafts are the right length and nothing else on the car fit’s the engine. It’s during a project like this you realise how many things there are connected to an engine. We’re currently working on new front suspension location points to give better traction and make the most of the new engine position. 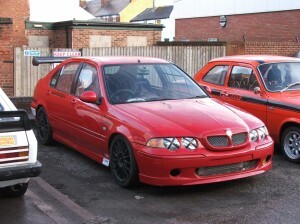 Development of cars like this is never ending but the owners enthusiasm seems endless so we’ve plenty to work with. 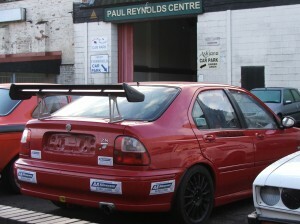 The rear wing is nothing to do with us by the way! This entry was posted on Saturday, February 6th, 2010 at 10:46 am	and is filed under Garage Services, Project Cars, Track day toys. You can follow any responses to this entry through the RSS 2.0 feed. Both comments and pings are currently closed. I think the rear wing looks great guys.